Having several medical problems,falling out of bed because of severe restless leg syndrome was very troublesome for me and my daughter with whom I reside. After falling out of bed, I cannot get up and have to call first responders via a Med Alert system. 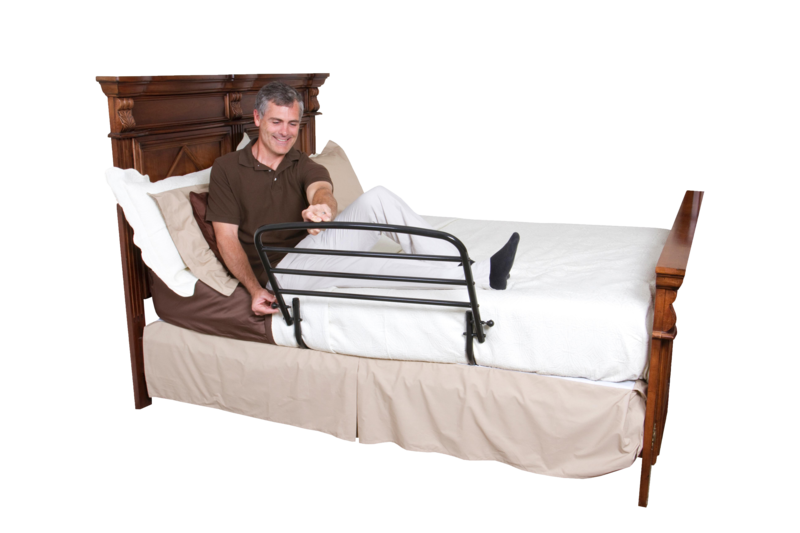 The bed rail which I obtained online from AllegroMedical is a Godsend! It prevents me from falling. When my body hits the rail while sleeping, I awaken sufficiently to move back to the middle of the bed. No more broken toes or blood vessels! Thank you AllegroMedical. As a well caretaker, this provides me peace of mind that my loved-one will not fall out of bed. I like the fold down feature, so that when not in use, bedroom does not look like a "sick room". It does require upper body strength to install, and on a queen size bed, probably 2 people. Easy To Clean. Durable. Good Value. I like the rail because I can put it down in the daytime and make my bed up. Grandma can sleep soundly again without fear of falling out of bed at night. Hides away discretely under the bedspread during the day to avoid embarrassment. We bought 2, one for each side of the bed, and couldn't be happier. by mary from Inverness, FL. 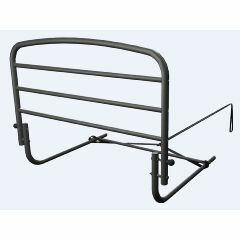 CAn this be used on the "folding bed" in the front of an RV ? Asked on Feb 14, 2016 1:40:15 AM by merlin from Northridge, Ca. HOW DO YOU GET OUT?DOES THE RAIL SLIDE DOWN?OR SWING OUT.LOOKS LIKE IT WOULD BE HARD TO GET OUT OF BED. You pull the knob down on the rail where it shows one on each side of it, and then it will fold down along side of bed. I've seen ones where they have those knobs to the inside of the rail, but this looks so much easier to do and then one can get out of bed. I've rolled out of bed two times in past year. I'm ordering this to keep me from getting broken bones and ending up on the floor, that is scary to wake up on the floor. would this rail attach to the foot of a traditional bed frame? will this bedrail fit on a queen size bed? What is the limit of the patient weight? Is it strong enough to allow a 275# man to lift himself up and out of bed?